Make the most of your short time in Auckland by exploring cosmopolitan Auckland and the tropical paradise Waiheke Island in one day with INFLITE Transfers. Take advantage of our convenient location in Mechanics Bay in Auckland’s CBD, the only helipad of it's kind in downtown Auckland. INFLITE transfers are true leaders in the private airline industry in New Zealand. Soaring to new heights and exceeding expectations, the team at INFLITE are invested in providing you with the best quality service and experience. 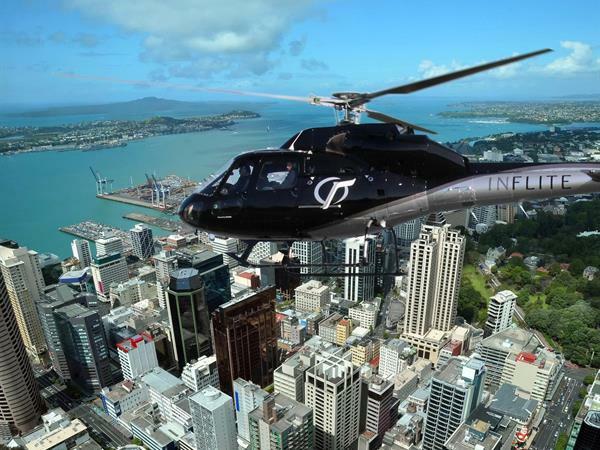 Our 12 minute flight is the fastest way to travel to Waiheke Island - all in the lap of luxury. The ferry ride from Auckland to Waiheke Island is time consuming - not to mention crowded! You will need to be first in line to get a seat at the front of the ferry with the best ocean views. When you fly with INFLITE Transfers, you have the best view in the house all of the time. Enjoy the sweeping views of the cityscape as you takeoff, followed by stunning views of islands dotting the seas.